In contrast with the earlier use of high-pressure waterjets in material removal in civil engineering and mining, when industrial waterjet cutting first began it was used to make thin cuts through different materials (in the early days often paper and wood products). Through cutting, particularly in relatively thin stock, has a wide range of industrial uses, particularly when the pieces are cut “cold” and with edge qualities that are, even with the first cut acceptable as the final surface cut needed for the part. Over time the advantages of this new cutting tool became more apparent, and the range of materials that the AWJ jet could viably cut was extended into metals and ceramics. Yet conventional machine tools do more than just cut the edges of parts, and so questions arose as to the best way to achieve the milling of internal pockets within different materials. Within relatively soft rock, and with pressurized water alone, it is possible to generate interesting shapes. When we first started experimenting with cutting rock at Missouri University of Science and Technology (MO S&T) the support equipment that we had was very basic, and the budget similarly restricted. In order to achieve precise positioning and control of the speeds during the cutting process, we therefore mounted the nozzle and support lance on the traverse of a conventional lathe. The samples were mounted into the chuck, so that we could achieve controlled cutting speeds. To get a number of sample cuts in a single test we placed a sheet of metal, with slots cut into it, between the nozzle and the rock. Figure 1. 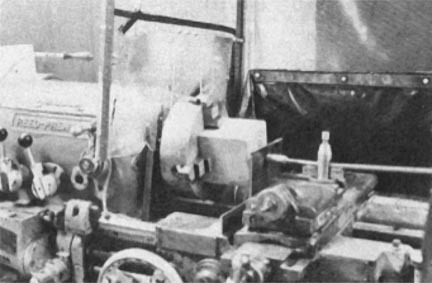 Rock rotates in a lathe while the nozzle traverses across the face. 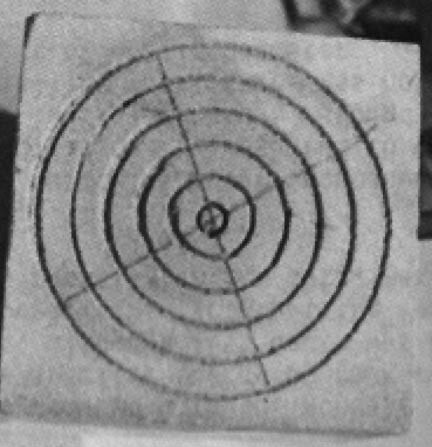 The notches cut into the metal plate were cut wide enough to allow the jet to make a single pass over the rock surface as the rock rotated and the nozzle swept past the slot, and they were widely enough spaced that the cut made through one slot did not interfere with the adjacent cut made through another. Figure 2. Slots cut through the mask into the rock target. After a while we became a little more adventurous and realized that, by making the mask an interesting shape that we could leave part of the rock uncut, but mill out all the rest of the material exposed to the jet, by adjusting the feed rate of the nozzle relative to the rotational speed of the rock. We thought at first that the feed of the nozzle (easy to set with the lathe) should be one jet diameter for each rotation of the rock, but the jet spreads as it moves away from the nozzle and this turned out to be a little too small a distance, and we ended up setting the feed at about 1.5 times the jet width. This “incremental distance” is going to vary between systems, as a function of nozzle design and size, jet pressure and the distance between the nozzle and the target. In this early work in the technology (this was back around 1972 IIRC) the nozzle stood back from the rock at about one inch standoff. In more modern applications that distance can be quite a bit less, and this changes the incremental distance. Also bear in mind that the speeds at which plain high-pressure waterjet cuts are most efficient are much higher, across the target surface, than the optimal speeds for AWJ work. So, since there was a need to remind folk that waterjetting could be dangerous if proper care was not taken during its use, we used this idea and made a sculpture. Figure 3. Skull figure carved out of sandstone. For simple lettering and shapes such as that shown above, the practice was to cut the desired shape into a metal plate, using perhaps a cutting torch, and then attach this over the rock. The two locations for the retaining wire can be seen on the sides of the piece. This allowed the plate to rotate with the rock piece as the lathe turned, and did away with the stationary plate between the nozzle and the sample. By adjusting the feed speed and the rotation speed of the piece a relatively smooth surface could be left in the excavated pocket. (See the depths of the eye sockets). The process is known as “Masked” milling, since the plate masks the sections of the rock that the jet should not be allowed to mill into. This works well when the work piece allows the use of plain high-pressure water, since it is relatively simple to make the mask out of a material (in this case steel) that the jet would not erode significantly. Thus the same mask could be used repeatedly to make copies of the original (though I think, in this case we only made around three or four). But what happens when the jet is an abrasive waterjet, and we want to make pockets in the same way as I have just described. Because the AWJ will cut through a thin mask it was not an optimal choice for the process. One can, with precise control of the nozzle position, have the jet move back and forwards over the desired pocket geometry. With the more accurate controls available today it is possible to slow the nozzle as it reaches the end of the pocket, increment it over the desired distance, and then have it cut an adjacent path back along the material to the start side of the pocket. Here the process would be repeated, moving backwards and forwards until the desired pocket geometry had been covered. The problem with this approach is that the depth of cut into the target is controlled, in part, by the length of time that the jet plays on any one point, or inversely as the speed with which the nozzle is moving over the surface. So moving the nozzle more slowly as it approached the edge of the pocket (which you have to do because the robotic arm driving the move can’t instantaneously stop, increment over, and reverse direction because of the inertia in the system) is problematic. This is true only however if the pocket has to have a smooth regular floor of a fixed depth but most, unfortunately, do. And slowing the nozzle at the end of the cuts means that the depth of the pocket would be deeper along the pocket profile, relative to the body of the cut. And so, for lack initially of an alternative approach, for some time the industry used masks that would protect the sides of the pocket, and provide a space over which the nozzle could decelerate, increment over, and turn back. 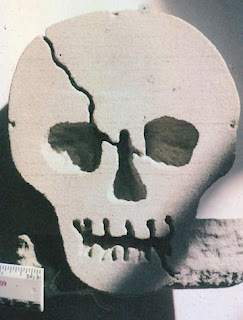 The mask would be eroded away, but in desirable parts (often expensive to make in the desired material) the ability of the abrasive waterjet to make the pocket in the first place allowed the expense of the mask to be written into the cost of making each part. There is, however, at least one other way of doing this, and I will discuss that, next time.